Nearly all Puma fans were pleased with the shoe’s snug and cozy fit. When worn for 8 hours straight, the sneaker remained comfortable, as mentioned by some reviewers. This trainer received heaps of praises for its unique, stylish and modern silhouette. A wide footed user remarked that the shoe provided sufficient toe space. Launched at a price of $110, many considered the shoe great value for money. Low, moderate and high arched consumers tried the Ignite Limitless and were satisfied with the ample support the shoe provided. The sneaker offered adequate stability for lateral movements, one user advised. Those who used the shoe for weight lifting, running, volleyball and boot camp style training were happy with its overall performance. A significant number of reviewers expressed contentment with the sneaker’s durable and lightweight construction. This versatile shoe can be worn dressed up and dressed down, more than a handful noticed. The shoe’s size runs a bit larger compared to Puma’s older styles, few mentioned. Less than a handful observed that the Ignite Limitless required one day up to several weeks to be broken in to get the right level of comfort. Others thought this trainer could have been released in more colorways. Some wearers advised that the sneaker fits a bit tight. The Puma Ignite Limitless is a technologically-advanced sneaker with a one-of-a-kind silhouette. Although fairly new to the game, this product has already won the adoration of many Puma and non-Puma supporters around the globe. Released at a price any John or Jane Doe can afford, the shoe continues to gain a loyal following, not only for its reasonable price, stylish looks and performance but also for its comfort, versatility and durability. Pioneering the development of new technologies and product designs in this day and age can be challenging. However, the people behind the brand Puma makes this difficult task look easy. With over 65 years of experience in the industry, the company has countless times impressed their avid fans with their innovative creations. Among the most recent works of this legendary brand is the Puma Ignite Limitless. Introduced in January 2017, this sneaker was launched as part of the “Run the Streets” project, a collection of street-ready running-inspired footwear and apparel that boasts of modern aesthetics and function created to perform well both on and off track. This trainer, rocked by famous “Starboy” singer Weeknd, in a span of a few months has already gained a loyal following. 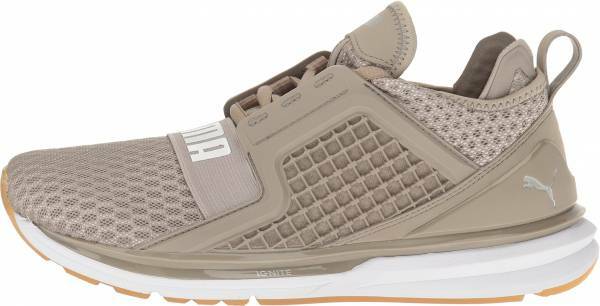 It is notable as well that various versions of the Ignite Limitless have already launched, each one well-received by many sneakerheads worldwide. Among the favorites are the Ignite Limitless Knit and NETFIT. Always on the go? Consider trying the Ignite Limitless. Built to endure the hustle and bustle of everyday city life, no matter the hour, this reliable kicks promises to perform and to keep your feet comfy and happy all day long. When it comes to its aesthetics, the Puma Ignite Limitless ensures to make heads turn and receive heaps of compliments. Released in 4 colorways, namely black, red, olive and gray, this mid-cut shoe’s eye-catching branding, luxe detailing as well as sporty and sleek looks go well with various casual clothing including jeans and sweatpants. This street-friendly running trainer-inspired lifestyle shoe, with its sock-like construction, ensures to surround your feet in comfort without compromising support. It also offers sufficient toe space. Available for both genders, the Ignite Limitless, is offered in sizes 7-14 for men and 6.5-12 for women in Medium width. This sneaker generally runs true to its width and length. Popular for its clam-shell construction, the shoe’s upper is made of a four-way stretch Ariaprene fabric that offers better airflow. Embedded on the sneaker’s midsole is the renowned Ignite Foam which provides premium cushioning and superior energy return. To top it off, the shoe is also recognized for its gore forefoot strap bearing Puma’s branding for ultimate support. The TPU heel clip and TPU Kurim midfoot cage are added for enhanced durability. The reflective detailing around the Puma Ignite Limitless is added for better visibility at night. A high-shine, full-length TPU jewel piece is strategically placed along the top line of the shoe’s tooling for a supportive ride. To achieve lightweight performance and added comfort, the shoe is also equipped with an injection-molded EVA midsole. The sneaker’s outsole has crystal rubber pods that provide traction and full ground contact. The weight of this shoe in size 10.5, Medium B width is 12.2 oz. Locked-fit can be achieved with the sneaker’s elastic band and lace-up closure, which includes flat shoestrings. Easily slip on and off the shoe with the help of the heel pull tab. Other distinguishable features are the “jumping cat” logo near the heel and the Puma callout on the flexible tongue of the shoe.